First official record: entered into the Stationers' Register by Andrew Wise on 25 February 1598 as "a booke intituled The historye of Henry the IIIJth with his battaile of Shrewsburye against Henry Hottspurre of the Northe with The conceited mirthe of Sir John Ffalstoff." First published: two quarto texts were published in 1598. Only a fragment of one (designated Q0) has survived, running from 1.3.201-2.2.105. 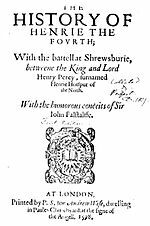 The other copy (Q1) was published under the title The History of Henrie the Fourth, with the battell at Shrewsburie between the King and Lord Henry Percy, surnamed Hotspur of the North, with the humorous conceits of Sir John Falstaffe (printed by Peter Short for Andrew Wise). This text was republished in 1599 (by Simon Stafford for Wise), 1604 (by Valentine Simmes for Matthew Lawe), 1608 (by John Windet for Lawe), 1613 (by William White for Lawe) and 1622 (by Thomas Purfoot for Lawe). The Folio text appears under the title The First Part of Henry the Fourth, with the Life and Death of Henry Sirnamed Hot-spurre. First recorded performance: possibly on 6 March 1600 at the house of George Carey, 2nd Baron Hunsdon for the Flemish ambassador. In a letter dated 8 March from Rowland Whyte to Robert Sidney, 1st Earl of Leicester, Whyte mentions that Hunsdon employed the Lord Chamberlain's Men to perform a play called "Sir John Old Castlle." Originally, Falstaff was called Sir John Oldcastle, but Shakespeare was pressured into changing the name. Although "Sir John Old Castlle" could be a reference to Sir John Oldcastle by Anthony Munday, Michael Drayton, Richard Hathwaye and Robert Wilson, the fact that Hunsdon was using Shakespeare's own company, rather than the rival Lord Admiral's Men, suggests the play referred to was in fact 1 Henry IV. Another possible performance took place on or around 14 February 1613, when either 1 Henry IV or Henry IV, Part 2 (or both) were performed at court as part of the celebrations for the marriage of Princess Elizabeth to Frederick V, Elector Palatine. A play performed under the title The Hotspur is thought to refer to 1 Henry IV. The first definite performance was on 1 January 1625 at Whitehall as The First Part of Sir John Falstaff. Evidence: as with Richard II, the play uses Samuel Daniel's The First Four Books of the Civil Wars as a source, meaning it could not have been written earlier than 1595. The fact that it is a direct sequel to Richard II would further limit the date of composition to no later than 1597 as Shakespeare would not have wanted to wait too long to capitalise on the success of the previous play. The controversy regarding the Oldcastle character also helps date the play. Shakespeare was pressured into changing the name by the descendants of the historical Sir John Oldcastle, particularly William Brooke, 10th Baron Cobham and his son Henry. William served as Lord Chamberlain from August 1596 to March 1597, and only in that period would he have had the authority to demand the alteration of a play which he found objectionable. This could indicate an initial performance in late 1596 or early 1597, suggesting composition took place roughly around the same time.